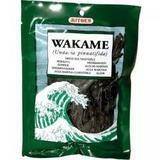 Although rare, some wild wakame, such as Mitoku's premium San-Riku Sun-Dried Wild Wakame, is still harvested in Japan. The cold Pacific waters are clean and clear, providing the perfect environment for wakame. The wild wakame from San-Riku has a vitality and depth of flavor that is unequaled by cultivated varieties. Mitoku Instant Wakame Flakes are known as "cut" wakame in Japan as they are cut fresh from only the premium line of wakame and turn a silky, beautiful, translucent green when added to miso soup. Cooks in just minutes! Each bag makes over 47 servings. Mitoku Mekabu (Wakame Root) - 1.76 oz. Mitoku Wakame Root, known as Mekabu, is the flowering sprout of the wakame plant and has a strong, sweet, and creamy taste. Highly revered for its nourishing properties since it contains more minerals than the blade. It is customarily drank as a medicinal tea. It is also delicious when cooked thoroughly, and goes well with grains, beans, soups, or vegetable dishes and may be deep-fried without batter. Mitoku Mekabu is harvested the old, traditional way by hand-raking the sea floor and is still only collected by women divers. Enjoy this Japanese culinary treat!